Here’s a problem I’ve recently hit at work. I hit the google geocode API with a couple of thousand addresses and stored the JSON results. Using the WebClient DownloadString method I didn’t think to set anything for the encoding. Browsing through the output files I see “DorfstraÃƒÅ¸e” where I’m expecting to see “Dorfstraße”. Urgh, mojibake! WebClient Encoding uses the system default. In my case, Windows-1252. If I had set this property to UTF8 I wouldn’t have these Mojibake files. I’ve got the files on my disk. How would I fix it? Here’s the plan to put things in reverse..
Well it’s been a while since I’ve updated the blog. I have been doing plenty of tinkering just need to write up a ‘catch up’ post in the next few days. In the meantime here’s a presentation I gave on Amazon Web Services for Sydney’s ALT.NET group. It’s best to watch it full screen on the HD resolution. I’ve recently setup 2-factor authentication on my Google account. The new 2nd factor or “thing you have” is a smartphone application which generates 6 digit one-time passwords. I was a bit surprised when I stumbled on this article Two Factor SSH with Google Authenticator. Turns out the algorithm used to generate the OTPs is an open standard. When you set-up an account in the smartphone app you are storing a key that’s used to create a HMAC of the current time. 2012-Sept-12: Something suspect about the way I’m converting BASE32 to bytes. Changed it to grab full bytes from the binary string, and ignore anything left over. Update 2011-02-19: Facebook appear to have changed their documentation a bit; I’ve just gone through the article to keep everything in line with the Facebook documentation. The old authorization URLs still work, just hoping to save any confusion. Another quick blog article just to settle/document some concepts in my own head, and hopefully provide a quick intro to someone out there. 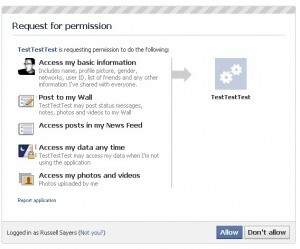 The Facebook Developers site documents all the APIs that you can use to integrate Facebook. Coming into this with no knowledge of the API can be pretty overwhelming. This article is a quick working example of authentication and the graph API. You can read the Facebook references here: Authentication and Graph API. The authentication here is the OAuth 2.0, this is the protocol you’d use if you want to write server side code to allow people to log into your site via Facebook, or link existing accounts. 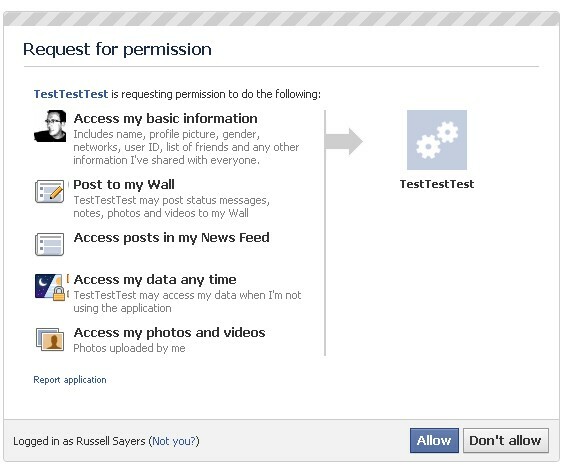 The authentication process also gives you an access token needed to read/write Facebook statuses/photos/etc via the Graph API. The -F arguments build a form POST, the @ attaches the file as a file upload, don’t forget to escape any pipe characters in your access_token with a caret. So that’s a quick intro to what is possible via the graph and authentication APIs. I see plenty of other APIs on the developer site I haven’t tinkered with yet. If you see anything interesting leave me a comment, and I might pull it apart in a new blog post!